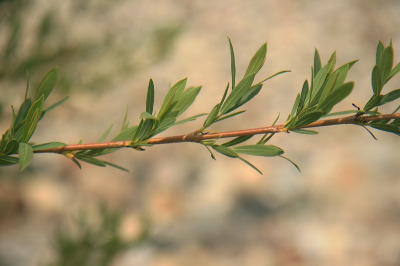 A European willow originally grown in this country for basket-making, locally well established as an escape from cultivation, especially on lake shores, riversides, and wet banks. The leaves tend to be opposite or nearly so, except on vigorous new shoots. Herbarium specimens are sometimes confused with S. pedicellaris; in addition to the habitat distinction and position of the leaves, S. purpurea has a distinctive purplish color to the foliage, the leaf margins are obscurely toothed toward the apex, and the axillary buds are (3–) 5–13 mm long on sprouts. MICHIGAN FLORA ONLINE. A. A. Reznicek, E. G. Voss, & B. S. Walters. February 2011. University of Michigan. Web. April 26, 2019. https://michiganflora.net/species.aspx?id=2639.